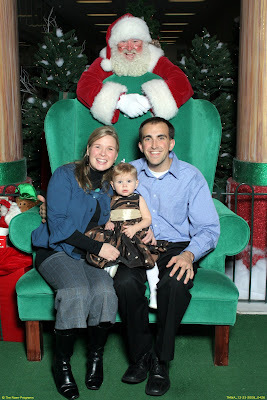 Abigail has talked about Santa all Christmas - pointing him out on every picture, book, Christmas ornament or decoration. We arrived at the Santa area, and she pointed him out excitedly. However, as we drew close she started to climb over her dad's shoulder to get away. Thus, Santa secretly stood behind us for the picture. Here's the secret tip for getting through the line to see Santa. It was a 1 1/2 to 2 hour wait in the line. However, there was a VIP line for "Kidgets Members." My husband was the super sleuth and figured out that for $5 you could join Kidgets in the middle of the mall and get a t-shirt, balloon, book and coupons and enter the VIP line. This is highly recommended to all future Santa visitors.